TBILISI, Georgia (CNN) -- Though Russia says it will begin pulling back its troops from Georgia on Monday, it's unclear how long the redeployment will take, and a Russian lawmaker has compared the situation to the U.S. presence in Iraq. Russian President Dmitry Medvedev says his troops will begin withdrawing from Georgia on Monday. 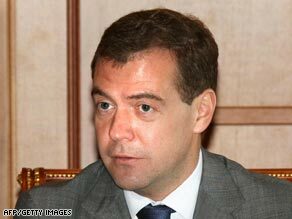 Russia President Dmitry Medvedev told French President Nicolas Sarkozy on Sunday that Russia would start pulling back its forces from Georgia on Monday, Medvedev's office said. Sarkozy, who holds the rotating presidency of the European Union, brokered a cease-fire between Russia and Georgia last week. Russian troops will begin withdrawing to a buffer zone and into the breakaway province of South Ossetia as stipulated by the cease-fire, Medvedev's office said. Moscow gave no indication of when the withdrawal would be completed. German Chancellor Angela Merkel, visiting Georgia, called on Russia to stick to its agreement to pull its forces out of Georgia within "the next few days." Speaking Sunday at a joint news conference with Georgian President Mikheil Saakashvili, she said a "very prompt withdrawal" was needed so international peacekeepers could be dispatched to Georgia. However, lawmaker Konstantin Kosachev, head of the Russian parliament's foreign affairs committee, said Moscow will withdraw only when it is "assured that Georgians will not continue to use military force" in the breakaway regions of South Ossetia and Abkhazia. Russian troops will leave "sooner or later," Kosachev said, saying the timetable depends "definitely on how Georgians will continue to behave." "If I would ask you in response to the same question how fast the American forces can leave Iraq, for example, the answer would be as soon as we have guarantees for peace and security there," Kosachev said. "The same answer would be toward this situation." The United States has been in Iraq since its 2003 invasion. Medvedev signed the truce deal Saturday, a day after it was signed by Saakashvili. The conflict began more than a week ago when Georgia launched a military incursion into South Ossetia to rout separatist rebels. The Georgian troops withdrew, and Russian forces took control of several areas inside the country -- prompting an international outcry.  Do not revert to force again.  Definitively stop all hostilities.  Give free access to humanitarian aid.  Georgian forces withdraw from areas of occupation.  Russian forces withdraw to positions at start of hostilities.  Open international discussions on South Ossetia and Abkhazia. Russia maintains it is protecting its peacekeepers and citizens from Georgian forces in the breakaway republics, but Saakashvili insists Moscow is trying to assert control over the former Soviet republic. "It is up to Russia now to decide whether it will continue to defy the world ... or accomplish its final goal of regime change in Georgia," Saakashvili said Sunday. U.S. Defense Secretary Robert Gates said he was skeptical that Russia would quickly withdraw its forces. "My own view is that the Russians will probably stall and perhaps take more time than anybody would like," Gates said in an interview broadcast Sunday. "I think we just need to keep the pressure and ensure that they abide by the agreement that they've signed, and do so in a timely way." Secretary of State Condoleezza Rice, who just wrapped up a visit to Tbilisi, also expressed skepticism about a prompt Russian withdrawal. "I would think that when the Russian president says that a signed cease-fire accord will mean the withdrawal of Russian forces, that Russian forces would then withdraw. They did not," she told Fox News on Sunday. It is unclear how many people have been killed in the conflict, but various claims put the figure in the thousands. The U.N. High Commissioner for Refugees said Sunday that it estimated the fighting has displaced more than 158,000 people, citing statistics from the Russian and Georgian governments. Almost 99,000 of those displaced were in Georgia, while 30,000 were displaced in South Ossetia and 30,000 have fled to Russia, the UNHCR said.